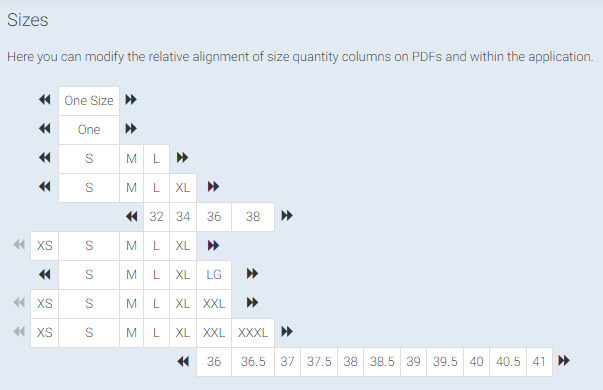 A sizing system is simply the list of sizes that your product sells in, separated by a comma. 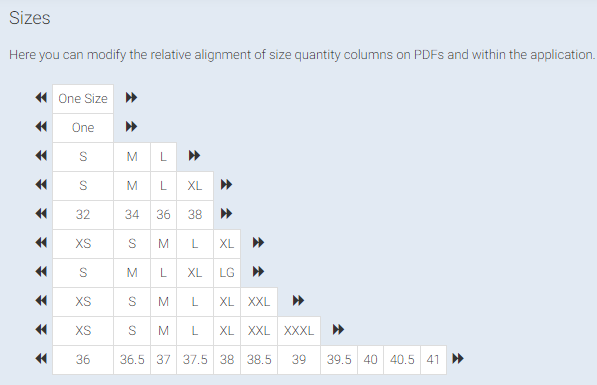 For example, "S, M, L" would define a sizing system with three sizes, "S", "M" and "L". When you enter your first product, you'll enter the sizing system manually. When adding subsequent products, you'll be able to choose from a drop-down of previously entered sizing systems. TIP: If your product comes in just one size, enter "One Size" or "O/S" as your sizing system, rather than the specific dimensions. This will minimize the number of different sizing systems, improving the appearance of paperwork and maintaining the ease of the use of the software. If you need to specify dimensions of your products, add the dimensions to the product name or description. Use the arrows to move these fields backwards or forwards to control the placement on your PDF documents. An example of a use case for the arrows is that in Figure 2 none of my Smalls are aligned. Using the arrows, I could rearrange my sizing so that all of the smalls are perfectly aligned (Figure 3). This is how it will be displayed on the Stitchex reports. Perhaps you would prefer to have everything left justified as shown in Figure 5. 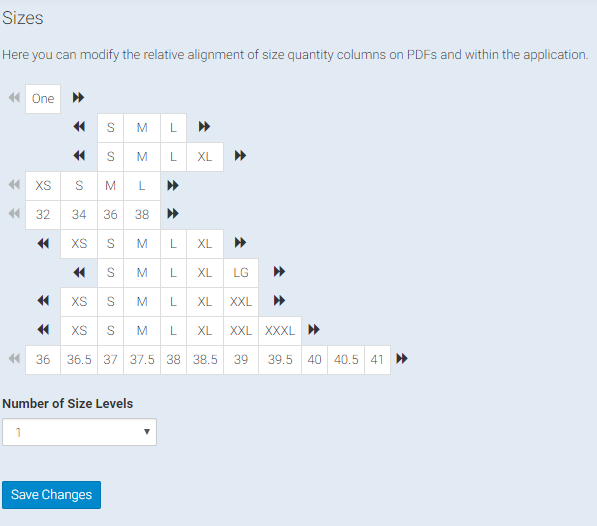 After creation, you can edit a sizing system within your Products by selecting an alternative sizing system from the drop-down list, or by clicking the "edit sizing system" link and directly editing the list of sizes in the Comma separated list of sizes. Please note that, for a given product, once you start selling or manufacturing a particular size, you will not longer be able to remove that size from the sizing system. If you try, Stitchex will present an error letting your know that the size is "in use". 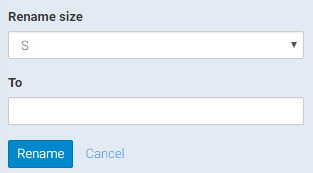 If you want to rename a size, you can do that by clicking the "rename a size" link below the sizing system drop-down.